As part of our commitment to providing education around the emissions system, we are pleased to bring you a case study and investigation below into a recent Vauxhall Vivaro DPF problem, as explained by our Technical Trainer, Stuart Still. “I recently visited one of my distributors who were having an emissions issue with a Vauxhall Vivaro van. At this point I visited the garage with my distributor, and explained that there is nothing wrong with the DPF, with this van having a Renault engine what he must do is carry out an engine oil and filter change, reset the ECU (using the Renault CLIP machine or a tool with the same capability) remove all fault codes and then complete a forced regeneration, followed by an ECU reset, it is then advisable to go for a drive for about 20 minutes at over 2500RPM, this should resolve the issue. 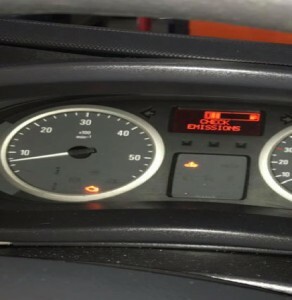 It is always advisable when any DPF related fault code appear to check the engine oil for diesel contamination, this is a common problem that can occur during the DPF regeneration process, which operates by sending up to 8 time the amount of fuel through the engine into the DPF which acts like a furnace raising the temperature to over 550 degrees that burns off all of the Particulate Matter. A build-up of carbon on the injectors, inlet valves, exhaust valves, turbo, EGR value, glow plugs are the major contributor to a blocked DPF. By using the EEC 6in1 DPF solution you can remove this problem, keeping these components free from carbon and primarily reducing the temperature at which particulate matter burns within the DPF. If a DPF does not regenerate due to engine related faults or driving practices (short, stop-start journeys) and fills to over 90% or 45 grams, the DPF will need replacing. This is not covered under warranty. The ECU must be reset, followed by a forced regeneration when a new DPF is fitted. This is to ensure that the ECU knows that the DPF and all related sensors are reset. Engine management light is on for any fault. If there is less than 20 litres of fuel in the fuel tank or if the fuel light is on regeneration will not take place. It is possible to carry out a forced DPF regeneration by using the correct diagnostic machine; depending on the vehicle this operation could be static or dynamic. Data & Procedures May Vary Between Manufactures. DPF are part of the MOT as from February 2014. It is illegal to drive a vehicle on the UK roads without a DPF if the vehicle has been designed run with a DPF. (Construction & Use) regulations 61a (3). Driving a vehicle that has had its DPF removed will invalidate your car insurance. EEC has an extensive range of DPF’s which is increasing day by day. EEC is committed to an education and training programme within the industry to help technicians understand, evaluate and diagnose emission problems. The introduction of type approval for catalytic converters has been a great leap forward and has created a more level playing field. EEC has invested heavily in our own wash coating facility in Hampshire, this is to ensure we produce top quality products for our home and export markets.